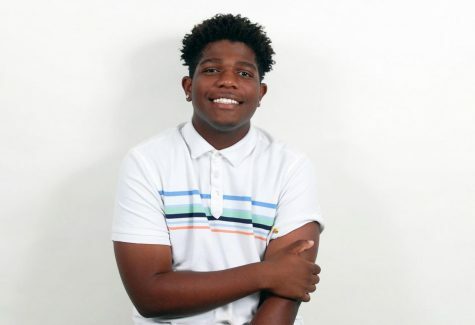 Jonathan "John" Shortridge is a junior at South Broward High School. John is interested in journalism because he loves current events and stories from the news. He signed up for journalism with his friend, Valery, and he is expecting to be able to write excellent articles for the Bulldog Bark, as well as outside sources. He is very passionate about music and is especially passionate about playing his Tuba in the band. When I asked John about his academic strength he responded "Math." "Math?" I questioned, I couldn't help but smile, "Most people don't really enjoy math." "It's like a puzzle," John said, "Math keeps on changing and challenging me." Although Johnathan is great at math, he is academically weaker in language arts. For his source of news, John watches 7 News for an hour, watches YouTube for an hour and thirty minutes, and goes on Instagram for thirty minutes. As for a job, John works at his dad's mechanic shop, side by side with his father. Surprisingly, Johnathan hates "Diss Tracks" because he does not believe it is real music, which I personally couldn't agree with more. Another interesting fact is, Jonathan thinks of himself as a dog in the sense he is less independent and prefers to have someone to rely on. To stay active John loves both basketball and soccer, but unfortunately, he does not play for the school's team(s). His favorite animal is also his spirit animal, a rhino, but his favorite insect is a tarantula. Outside of school, John loves hanging out with his friends and playing his Tuba. When I asked about what he would never be caught dead in he said Balenciaga clothes and shoes. John said, "Balenciaga items are so expensive and I don't even like the way they look." If he could meet three people, dead or alive, John immediately said, Bob Marley. To John, Bob Marley has a cool vibe and an aura to match. Next, he said, DJ Khalid, because he is motivational with everything he says, as well as does. Lastly, John said 2Pac but quickly said, "Never mind! The last person I want to meet is Tyler the Creator. He's a legend!" John is inspired by Tyler being able to try new things with everything he does, not just in music. John's favorite movie is the first "Paranormal Activity", we both agree the first "Paranormal Activity" was the best because it felt so real. After the first movie, people watching could tell it was just a fictional situation and not actually based on real-life situations. When we talked about part(s) of himself he would like to improve he said he wishes he could be more outgoing, "I use to be really outgoing, now I'm not as outgoing as before." I was taken aback, "More outgoing? You're so outgoing, charming, and you're easy to talk to." John laughed, "But I want to be more outgoing with people, I also wish I was more energized." I nodded my head rapidly, "Believe me, I get that." I had such a pleasure getting to know Jonathan, he's such a sweetheart and full of ambition. I aspire to be as happy and sweet as John.